I cannot believe how fast February is flying by! 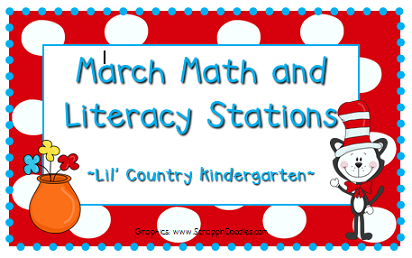 I am currently working on trying to get a jump start on March station ideas for Math and Literacy. Hopefully this will give everyone enough time to get things added, as well as, time to get things printed and assembled for March. I don't have a whole lot added yet, but I'll add things as I find them. If you have additional freebies or things that don't fit into the work stations category, feel free to list them, as well. We don't want to miss out on anything fabulous! If you would like to include a link to your own items, please fill out the form below. Your activities can be free or for sale. You can link to as many products or activities as you would like. Thanks Marlana for putting this together! I added two more links to it and it showed up instantly, so cool. Thanks for showing me something new to do in google excel. Thank you! I love that it's automatic. I use to primarily use LinkyTools, but then had to keep going back through posts to see the new submissions and then the linky would be closed after a certain date so no one could add anything. I like being able to add resources and for others to add them if they want to share! Finally got a chance to post something! I added my 3D shapes poster we do whole group as a intro activity and then a small group/center activity that goes with the book Shapes That Roll. Thanks so much! I will check it out soon!